My kittens meow constantly, at night. They are a little over two months old now and I know this is normal kitten behavior. I was going to start clicker training them to understand that silence is better than meowing incessantly for an hour straight. But I'm waiting for the clicker to come in the mail first. I do the same thing every night, play with them for at least fifteen to twenty minutes, feed them dinner and cuddle with them. Each night since I've had them they've been really good about realizing it's bedtime and winding down after that, I start turning lights out and getting ready for bed. But last night! They were tired, I could tell, I would hold them and they would start to doze off. We had a nice long play session and dinner and they were in their bed, kneading and suckling their blanket and dozing off. So, finally, I laid down and fell asleep. About thirty minutes maybe less, they were awake and meowing and crying, one of them in particular. I guess this is what catnaps means! Anyway, I don't mind if they're up, I just would love for them not to bother me. I figured they have each other and would entertain each other but lately, they haven't been doing that as much and instead if I stop paying attention to them individually, cry and cry and continuously try to jump to wherever I'm at. I don't like them on my bed, but last night, I put them both up there because it actually got me more peace than not. Except, I still slept badly because I'm very not used to sharing a bed, with anyone or anything. The way my living situation is set up all my rooms are connected so there's no, locking them in the kitchen. Although I did think about the bathroom but it's right off my bedroom so I'd still hear them just as loud. I've tried ignoring them but after a while, the meows are unbearable! They sound like they're in pain or sad or something and I always give in and see what's wrong. I know this is only reinforcing the behavior but I'm at wits end. I just need to hold out until I get my new apartment, which will be a much better living situation, in four weeks but until then, I really, really really need sleep. I can't just ignore their cries though because I tried and the longest I held out was about ten minutes after which they just started to get louder to the point that my neighbors complained. So, I'm wondering what advice anyone has. I've been Googling and tried so many things but nothing seems to work. I just want them to not meow, that's all, and to stop jumping onto my bed at night. Otherwise, they don't have to sleep, they can be up, just as long as I get to sleep. I know kitties are nocturnal. It sounds like it was just last night? If so, that's not too bad. Can you set up a little bed for them next to yours that they would use? How soon after dinner is their bedtime, do you think you may be feeding them too late in the day and they're still digesting their meal when they should be going to sleep? I hope they're not in pain or sad anyway. I live in a house, so my cat always had the option of sitting on a windowsill in a couple of rooms and looking outside, does your apartment have windows for them that look outside at grass or trees? Yes, actually thats pretty good. They just started it last night. Normally once they're in bed there's been no problems. I actually did move their existing bed right next to mine. At first, it seemed to help but then they were up and meowing up a storm. I'm thinking something is wrong but the only thing that has changed is I have them wet food for dinner once and they inhaled it. Big mistake though because then they vomited and have been having diarrhea ever since. I have not given them any more new food since then, only the food they have been eating since I got them. I actually called the vet and they told me HI upset is normal if you don't gradually introduce a new food. Rookie mistake, I guess. I was worried about their poo but the vet said it was nothing to worry about. They are getting their next set of shots and wellness check-up on Monday, so I'll be sure to mention my concerns again. They don't seem to be in pain, they play with me and each other just as rambunctiously and they have good appetites. I do have a few Windows but right now they need help getting to the sill and once they're up there they need help getting down, so I can't leave them there while I'm out. I think maybe I'll have them eat dinner earlier although they tend to get up even at night and eat a snack. It's a gravity feeder and the vet said it was fine since i can't overfeed them because theyre still growing. I'm considering switching to giving them regularly scheduled meals though. How much canned food were you giving them when they gulped it down? I've been letting my cat free feed dry since he was a kitten, and only give him 1/3 of a can of food per day now that he's an adult. He's not food driven like Garfield , so he rarely gulps any cat food down. He does love and inhale the freeze dried treats I give him, so the pieces I give are small and few. Awww....so cute that they need help to get up and down from the sill, they really are tiny babies. It was one can, actually a third of a can and I split it between them. The instructions on the can says one third per pound of cat and they each weigh a little over a pound but I didn't want them to eat just wet canned food. I'm thinking they're better with dry food anyway. And if I do give them wet again, I'll know better and introduce it gradually. But yes they are still tiny babies. However, I'm very suspicious they are sick or something because they are meowing constantly now. They constantly try to climb me but when I pick them up, they then immediately want to be put down. They're also pooping often. Their poop is peanut butter colored and loose but not watery. I just want the healthy little tootsie rolls back. The vet said they're fine, probably their tummies upset from my inexperienced introduction of new food. So, I'm wondering, if this happens to kittens, how long does it take for their GI systems to get back into shape. I'm afraid with the diarrhea, it's not quite that but it's not little nuggets either, they won't put on weight. They do sound like something is upsetting them with the climbing on you, then wanting to get back down. Good that you're seeing the vet on Monday in case there's a problem. I use an over the counter product for diarrhea that works very well, luckily I don't need to use it very often. 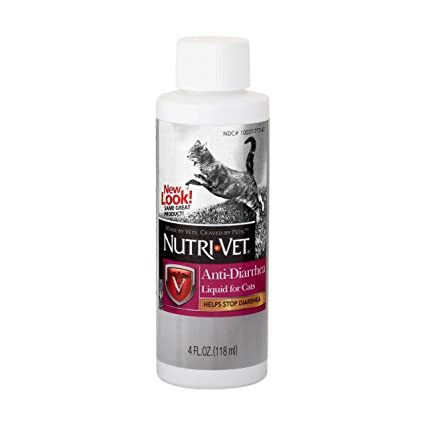 It's NutriVet Anti-Diarrhea liquid for cats, but I've used it for my dog too at times, just in larger doses. There's nothing on the label about age restrictions, but yours are so young, I'd check with the doctor first if you choose to try it out. I get mine at Petco, but it's available online too. Tootsie rolls are so welcome after an incident with loose stools, I know from experience, I never take the Tootsies for granted. In my opinion, it's adverse to take them in your bed if you really dislike sleeping with animals, because they could get used to sleeping with you and meow louder at next night for begging you. If your kittens are new members at home, they could feel scary when you turn off the night and enter the room, so meowing is a signal of lack of security sense. They will stop meowing after adapting to the new environment, but avoid to lock them into a room or kitchen, which could increase their scare. After closing your door, you shouldn't interact with them. Otherwise, they could regard it as your response and meow constantly. I have the similar experience with you when picking up my second cat back home. I wore the earplugs for several nights until he started to play with the older cat and stopped meowing. Also, I prepared a box with some toys, a cat loves to shelter in the gloomy place. If he/she says this a 'no pets' building, you could apply for an ESA. What's more, you should ensure your kittens are well-behaved quiet. Yes, I think my mistake is that I allowed them to sleep with me the first night I got them home. Maybe a rookie mistake? They were so adorable and I immediately fell in love with them and felt sad because they were crying in their bed. Maybe I shouldn't have done that? I have nowhere to lock them currently, due to the open floor plan of my apartment currently. The one I'm moving into in a few weeks has a bedroom and bathroom that are connected and a kitchen and living room that are connected. I certainly won't be locking them in my bathroom because they will be meowing all night probably and keeping me up. I am planning they can have run of the apartment when I'm asleep but my bedroom door will be closed. There is no concern about being allowed to have the kitties in the apartment. I've already confirmed with them and they only have a no dogs, except in special cases policy. I'm finding a lot of apartments are like that. Cats are okay but no dogs. Right now that works for me. Although I would like a dog in the future but that can wait until I have my own house. Anyway, I'm hoping they will adapt to the new environment soon. It will take time I know, but it's been two weeks, I'm sure that may not be enough time. I realize I just have to be patient and work with them. They have each other but I noticed at night they don't play with each other as much and instead demand my undivided attention. I was recommended to get two and not one because getting two would prevent this from happening at night. Either that's wrong or maybe they aren't as bonded a pair as I thought. Either way, they're adorable just a lot of work. I know I will probably look back once they're older and sunning themselves all day without giving me even a sideways glance and miss it! My boy constantly eats sticks and wood when out! CAT'S MEOW CAT TOY...Looks Like Fun, do You Have One for Your Cat? Kitten constantly biting us??? and LOTS of food throwing!!! !